The benefits of St. John's Wort are many. This beautiful and useful herb contains antibacterial properties. It relieves minor depression, and may eventually yield a treatment for alcoholism. Native to Europe, 340 species of St. John's Wort (Hypericum perforatum) thrive in such diverse climates as North America, Europe and Asia. Common names for St. John's Wort include Tipton Weed, Klamath Weed and Klamathweed. The flowers are harvested, dried, and made into powders, tinctures and teas. Herbalists taught their apprentices to harvest St. John's Wort on the Feast of Saint John the Baptist, or around June 24th, when the yellow flowers were at their peak. Gradually, the name evolved to St. John's Wort or St. John's Weed in honor of the feast day. According to the National Institute for Complimentary and Alternative medicine, the benefits of St. John's Wort come from two chemical compounds: hypericin and hyperforin. Although scientists have not isolated the exact mechanism by which St. John's Wort works, the prevailing theory is that the chemicals prevent the reuptake of serotonin in much the same way as many common SSRI antidepressant medications. Serotonin is the chemical within the brain that lifts mood. Psychiatrist believe that the biological causes of depression may be too little circulating serotonin or a problem in how the brain takes up or reuses the existing serotonin. St. John's Wort and SSRI medications work by altering the brain chemistry that affects serotonin. The Europeans frequently choose St. John's Wort to treat mild depression. The herb is catching on in the United States as more and more people seek help and treatment for depression. In both Europe and America, St. John's Wort may be purchased over-the-counter. In Ireland, St. John's Wort is only available by prescription. Use St. John's Wort to treat a variety of conditions. Topical ointments and creams containing St. John's Wort treat bruises, sprains and contusions. It aids in healing wounds and cuts. Taken as a tea or capsule, St. John's Wort acts as an antidepressant. 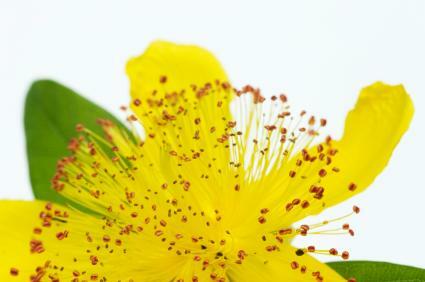 St. John's Wort provides powerful antibacterial action as a skin cream. Hyperforin, one of the two chemicals assumed by scientists as the active ingredient in St. John's Wort, kills Staphylococcus bacteria, particularly the kind resistant to antibiotics. Smooth St. John's Wort cream onto cuts, bruises, and any breaks in the skin to prevent infection. If you can't find St. John's Wort cream, use a highly purified tincture mixed into an herbal salve base to make your own. Among all herbal treatments for depression, St. John's Wort is perhaps the best known and studied. A translated summary of research from the Department of Pharmacology, J.W. Goethe University in Frankfort, Germany, states that "a number of good clinical studies have been carried out which confirm the efficacy and tolerability of St. John's Wort extract in mild clinical depressive disorders." Some studies have shown that it is equally as effective as many prescription tri-cyclic antidepressant drugs and has fewer side effects. Yet other studies from the National Institute for Complimentary and Alternative Medicine show that St. John's Wort is no more effective at treating depression than a placebo. While scientists in North America and Europe continue to conduct research on St. John's Wort, centuries of use point to some benefit for the relief of depression. Depression can be a serious illness, so always consult a physician for advice. Typical use of St. John's Wort for depression includes capsules and tinctures. It takes several weeks for St. John's Wort to relieve the symptoms of depression and anxiety, so if symptoms worsen consult a physician or mental health professional immediately. Promising new research indicates that St. John's Wort reduces cravings for alcohol, thus making it a promising avenue for future research and treatment of alcohol addiction. Doctors aren't sure exactly why St. John's Wort reduces alcohol cravings, but the theory they've come up with is that alcoholics are 'self medicating' an intuited imbalance in brain chemistry, and St. John's Wort is restoring the balance. Research on herbal alcoholism treatments is extremely preliminary, and more studies are needed before any conclusions can be drawn. Before you rush out and buy St. John's Wort, consider the contraindications. Although St. John's Wort is relatively safe, it does increase photosensitivity. Persons taking St. John's Wort should use extra care and caution in the sun, covering skin with clothing or using a high SPF sun block to avoid a bad burn. St. John's Wort also interacts with many prescription medications, notably antidepressants, digoxin, oral contraceptives, warfarin, and over the counter drugs such as the antidiarrheal drug loperamide. Consult a physician before taking St. John's Wort if you take any prescription medications.